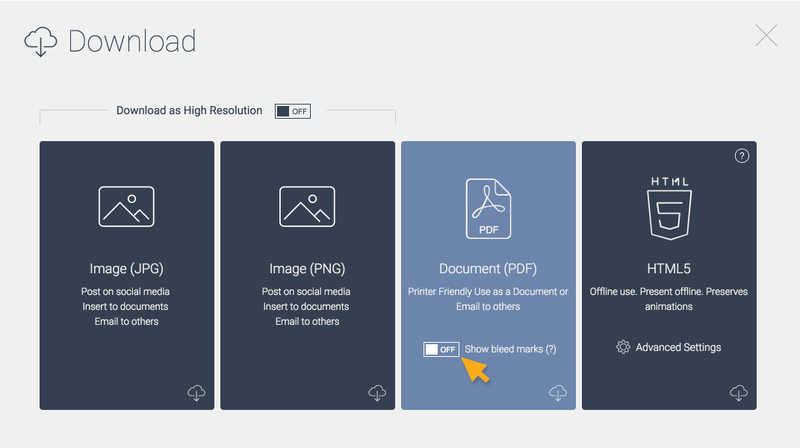 To print your project at home, you first need to download your project by clicking on Download at the top right side of your screen. In order to have high quality prints, it is recommended that you download it as a PDF file. Setting the margins for printing is essential. Crop marks and bleed marks will ensure that there’s no white space around your design. By turning on the bleed marks in the PDF download option, it will tell you where the print goes beyond the edge of where the sheet will be trimmed. Margins play a big role in printing because it lets you know that if the texts or objects you had in your design is too close to the border, it might be cut.